Second-year CUA Law student Melissa Mulrey Soares outlined her concerns about a 2014 ruling from a California court in favor of a lawsuit brought by public school students who claimed a right to a “quality” education. The ruling curtailed some of the rights and privileges established by teachers’ unions in the state. Soares said what while nobody would oppose the goal of a quality education for all, the ruling “does not balance the competing issue of children’s right to quality education with teachers’ competing due process rights.” The basic problem, she argued, is that there is no standard definition of what a quality education is. 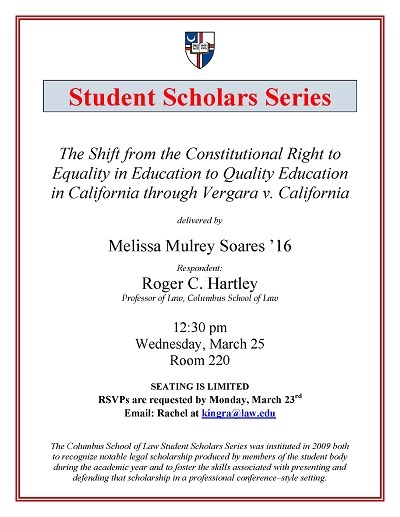 Mulrey Soares, Melissa, "The Shift from the Constitutional Right to Equality in Education to Quality Education in California" (2015). Student Scholar Series. 18.